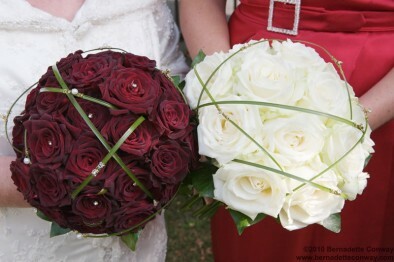 Two compact rose bouquets with grass caging, the dark red velvety rose is ‘Black Baccara’ and the large ivory rose is ‘Avalanche’. These bouquets suit most dress styles and can be made in large, medium or small sizes. Year after year, they tend to be a very popular choice with brides.